We have developed a program to effectively carry out medication administration services needed by our residents. The program is practiced by our trained medication technicians. Nurses and health aides must ensure administration of appropriate dosage of medications. Nurses and health aides must assess residents for any known allergies and previous experience of adverse drug reactions. 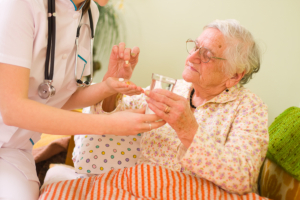 Nurses and health aides must give the medications at the right time, and necessary documentation must be done after administering the medication. Nurses and health aides must execute necessary intervention in the event of any adverse drug reaction. This Medication Administration Program is regularly reviewed for applicability inside the facility and necessary changes are taken in a timely manner to further improve it.